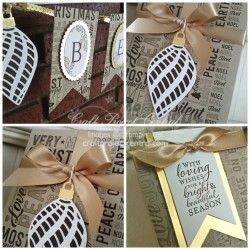 Just Julie B's Stampin' Space: Be Merry Banner Gift Set! Deck your halls in a non-traditional style with this pretty banner. The flecks of gold are sure to add sparkle to this simple décor piece. Are red and green more your cup of tea? Easily switch out the colors to make a banner fit for your mantle. Looking for an easy holiday gift? Package up this beautiful banner in the matching box and present it as a gift with the coordinating card. This would make an excellent class project or hostess gift! This super pretty project was made by Amanda Corbet and you can get her tutorial when you subscribe to the month of November over at Craft Project Central.